The Fairly Odd Novelties brand Ammo Shot Glass Belt is sure to be a blast at your next party or tailgate! All 8 bullets in this clip holds 1.5 US fluid ounces and has a spill-proof lid, so you can move from mission to mission without worry of spilling the goods. This Ammo Shot Glass Belt makes the perfect novelty gift for the military enthusiast and party animal in your life alike! 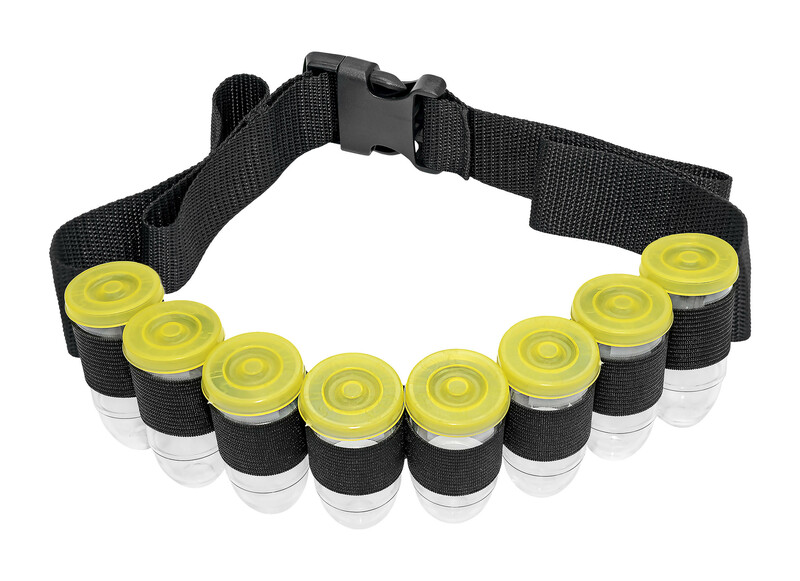 The Fairly Odd Novelties brand Ammo Shot Glass Belt is sure to be a blast at your next party or tailgate! With its sturdy, woven nylon waistband and individual holsters, you can bring enough of your alcohol for the whole group! All 8 bullets in this clip holds 1.5 US fluid ounces and has a spill-proof lid, so you can move from mission to mission without worry of spilling the goods. This Ammo Shot Glass Belt makes the perfect novelty gift for the military enthusiast and party animal in your life alike! Order today so you can provide a shot of fun at your next birthday, bachelor/bachelorette, or white elephant party, as well as any tailgates or college festivities you may attend! Nylon belt adjusts up to a 44" waist.